A pair of swords has long been a great thing to display. The Samurai did it with their legendary daisho set, and many other warriors had swords made in pairs, too. This Double Sword Wall Mounted Rack is perfect for displaying any sets you might own. 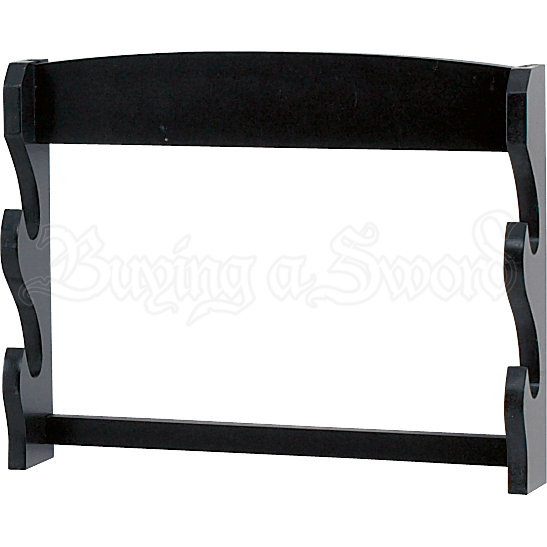 This sword rack has a very traditional look, thanks to its hardwood construction and its black lacquered finish. It is also designed with a very subdued look, which ensures that when mounted and set with two swords, all attention goes to the weapons it holds, rather than the rack itself. As its name implies, this wall-mounted rack is designed to be hung or mounted to a wall, as it lacks the stable base to stand freely, on its own. This Double Sword Wall Mounted Rack is perfect for elevating a sword and its decorative sheath, as well as a great way to pick up your favorite katana and wakizashi daisho and transform it into a stunning display to have hanging on your wall.